when two organizations, both dedicated to collaboration but in different ways, were founded in the Diocese of Cleveland. Catholic Community Care was an association of senior living ministries. Focused on the needs of older adults, it offered a continuum of health and human services care while strengthening Catholic traditions and values. Caritas Connection, a joint venture of Catholic Charities, the Sisters of Charity Health System and the Diocese of Cleveland, was dedicated to making Catholic health care and social services more accessible to all those living within the Diocese of Cleveland, but particularly to the most vulnerable or marginalized populations. In the first decade of their existence, these distinct organizations established new programs, promoted collaborative efforts, and convened gatherings of employees of Catholic ministries to address unmet needs. Among the programs begun: a healthcare program for refugees, in collaboration with Catholic Charities’ Migration and Refugee Services, St. Vincent Charity Medical Center and Cuyahoga Physician Network; and the Deaf Access Program (DAP), which improves access to health care for people who are Deaf and Hard of Hearing. While initially focused on health and human services, the organizations also developed partnerships with the region’s Catholic higher education institutions. 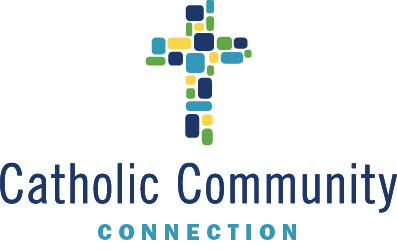 In 2007, Caritas Connection and Catholic Community Care merged to form Catholic Community Connection (CCC), which now consists of 19 of the major Catholic healthcare, senior living, social services, and higher education ministries in the greater Cleveland area. We join to foster creative collaborations among our organizations, to promote joint efforts towards better stewardship of resources, and to ensure coordination of health and social services for the people of God in our midst. At the forefront of CCC’s mission are those served by our partner organizations in their individual ministries of teaching, healing and caring. Still have questions? Find out more here! Learn about ongoing and past initiatives and what we offer to the Diocese of Cleveland.